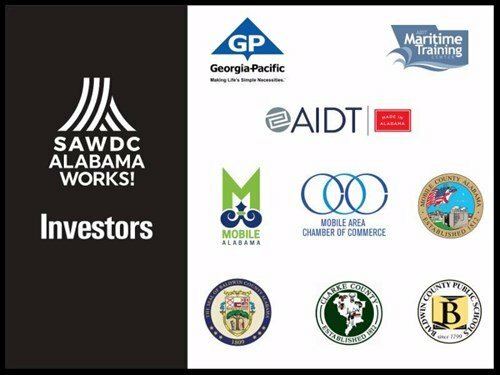 SAWDC Alabama Works is an employer-established and employer-led non-profit organization whose mission is to develop strategic partnerships which attract, educate and train students and workers to better meet employer needs and foster economic growth in a global marketplace. With a vision to create a fully comprehensive, integrated workforce development system, SAWDC has partnered to establish four high quality workforce partnerships – a sound strategy for helping individuals obtain and advance in good careers while at the same time ensuring that employers have high-quality skills that are needed to compete in today’s dynamic economy. The four industry clusters – aviation, maritime, industrial construction/manufacturing, and healthcare – were chosen due to the high demand and high growth prospects for these industries. With a dual customer approach, SAWDC convenes, organizes key stakeholders, and maintains persistent attention to the needs of the two main customers: employers and workers. By engaging employers and other partners in identifying workforce needs, SAWDC aligns funding from various sources and brokers services that address the career advancement needs of employers and lower-skilled adults. To develop strategic partnerships which attract, educate and train students and workers to better meet employer needs and foster economic growth in a global marketplace. To develop a comprehensive, integrated workforce development system which creates a skilled, diverse, motivated, adaptable workforce that better meets the needs of employers and leads to a better quality of life for our citizens. Roughly one dozen one-on-one interviews followed by a day-long Aug. 30, 2016, Regional Prosperity Strategy Workshop have yielded a working draft for the Partners Council Regional Strategy Map with a clearly defined mission of growing and maintaining a workforce that meets the needs of southwest Alabama. The long-range goal of the Partners Council is to create a seamless exchange of information and resources that marshals all of southwest Alabama’s workforce development expertise and then aligns it with relevant education and training program, buoys it with access to social service assistance and facilitates its implementation with access to appropriate funding mechanisms. The first draft of the Partners Council Regional Strategy Map focuses specifically on building healthy communities, providing relevant education and facilitating a robust economy – the three key tenets identified as comprising the full workforce development spectrum. This effort incorporates and reflects the input of and anticipated roles of regional community partners, dedicated to providing not only employers with a pool of qualified candidates but residents with opportunities for development, employment and career advancement. Since 2008, SAWDC Alabama Works has been charged with engaging industry and serving its workforce development needs while helping to align the region’s education/training resources with that ever-shifting demand. Simply put, SAWDC works year-round to develop strategic partnerships that attract, educate and train students and workers to better meet employer needs, and that mission could not be accomplished without the ongoing financial support of the council’s dedicated and generous investors. Their assistance is absolutely instrumental in SAWDC’s efforts to develop a comprehensive, integrated workforce development system that creates a skilled, diverse, motivated and adaptable workforce that better meet the needs of employers and contributes to an improved quality of life for all citizens. In turn, we would like to extend our most sincere thanks to the following 2017-2018 investors.